None of us could imagine waking up in a coffin. It could be our worst nightmare. 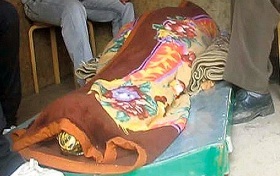 A 49-year-old Russian women who was declared dead woke-up in her coffin only to die 12-minutes later. Fagilyu Mukhametzyano, was pronounced dead after she collapsed at her home after suffering from a heart attack. Her spouse Fagili made all the arrangements for her funeral. But it seems, Fagilyu was not dead. She woke-up in her coffin listening to mourners around her praying for her soul. Shocked, she started to scream. Fagili immediately took his wife to the hospital, but she lived only for another 12 minutes in Intensive care. It is believed that she died of shock. “Her eyes fluttered and we immediately rushed her back to the hospital but she only lived for another 12 minutes in intensive care before she died again, this time for good,” Fagili said. As to be expected, Fagili is upset about his wife’s unusual fate. “I am very angry and want answers. She wasn’t dead when they said she was and they could have saved her,” Fagili said. Credit Card stuffed wallet saves man's life! Next: Blackberry Playbook is Here!